Charter Week & Glow Big Red | UNL Band Alumni Association, Inc.
It’s Charter Week, and along with it Glow Big Red! 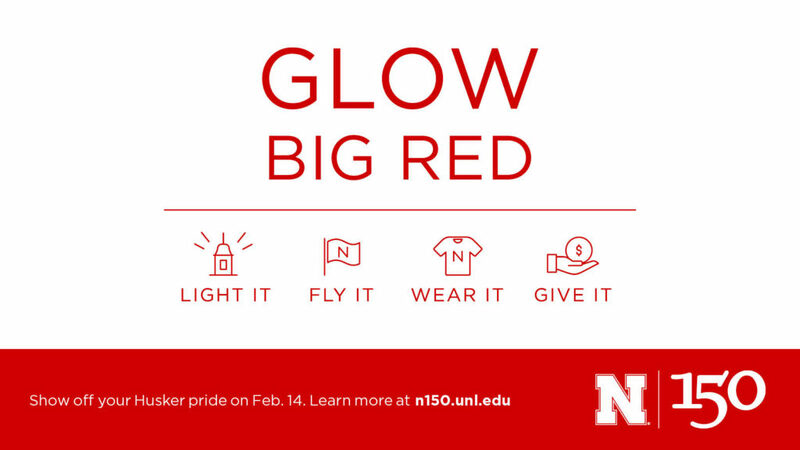 Glow Big Red calls on all Huskers (students, alumni, faculty, staff and friends) to show their spirit for the university on February 14. LIGHT IT: Red burns brighter. Prove it by lighting up your house or windows with Husker red lights and glow sticks. FLY IT: It might not be game day, but you can wave, spin or toss your Husker flag like it is! WEAR IT: Wear your favorite Husker apparel (i.e. your Band Alumni shirt), or throw on a pop of red to show your Nebraska pride. GIVE IT: Build the next 150 years of excellence by contributing to your university during its 24 Hours of Husker Giving. You can use the buttons at nebandalums.org to give directly to our funds, or you can choose to donate to the University of Nebraska Foundation. Anyone who snaps a photo, video or other digital content and posts it on social media using the hashtag #GlowBigRed showing how they light it, fly it, wear it or give it, will be entered to win N150 prizes from the university. If you don’t use social media, submit your photos to social@unl.edu to enter. Entries will be collected from now until Feb. 15. Winners announced on Charter Day. Here is your chance to highlight your CMB pride. Consider a photo with your instrument, Band Alumni shirt, or your CMB family.